Seaports serve a critical function of the region’s economy, moving goods from abroad to a large consumer market and supporting thousands of industrial and service jobs. Although the region’s seaport is the second largest in the United States, it is far less efficient than others, and fails to take advantage of the region’s extensive rail network. A new governance structure, and more investment in port facilities, rail connections, and access roads could lead to more port-related jobs and revenue, a bigger regional economy, and less truck traffic. The Port of New York and New Jersey is the second largest seaport in the nation, handling over six million containers and millions of tons of bulk cargo annually. But the port’s facilities are inefficiently managed. Terminals are not state of the art, and little investment has been made in the new technologies that would allow for reductions in air and water pollution. Lack of automation and outmoded management practices have kept labor costs high and reduced the port’s output. Connections to roadway networks are inadequate, and nearby roadways are often congested. While other ports around the country turn a profit, the Port of New York and New Jersey barely breaks even—at times even requiring a subsidy. The port’s deficiencies are enabled by a governance structure that provides insufficient transparency and incentives for efficient operations. The Port of New York and New Jersey also sits in the middle of one of the densest rail networks in North America, yet hardly any of the region’s freight is moved by rail. Nearly all the goods imported through the seaports are carried to their final destinations by truck, despite record congestion on roads and highways. Freight rail could provide a more reliable and efficient alternative—a single freight railcar can eliminate four truck trips—especially given the dense concentration of rail infrastructure in the tri-state area. But there are few rail lines dedicated to freight, and passenger rail operators typically refuse to allow freight operations on the busier parts of their network. The result is a segregated and underused rail network. Reform the governance of the seaports to incentivize greater efficiency and modernization of the infrastructure. This could be achieved by giving the seaports greater operational and financial autonomy from the Port Authority of New York and New Jersey, increasing transparency and accountability within the ports. Close and redevelop both the Red Hook container terminal and the southern Brooklyn (Sunset Park) seaport facilities. Both of these facilities are outmoded and have poor links to transportation. Their operations should be consolidated to ports in Staten Island and New Jersey, freeing up land for new parks, housing, and light industrial uses. Expand Staten Island’s New York Container Terminal to include the long-planned Port Ivory redevelopment. The port is well connected to the highway and rail networks, especially with the recent completion of the new Goethals Bridge. The direct ramps from the bridge to the port that have been proposed should be built. Modernize and improve access to Port Newark—Elizabeth Marine Terminal. The port should be densified, from five container stacks to seven, and its efficiency increased. More automation will enable it to increase throughput and revenue. Local road access should be improved to all facilities, including preferential treatment for trucks. Prepare Bayonne Peninsula for growth. In 2010, the Port Authority bought 130 acres in Bayonne for a mix of residential development and future port use. As part of this initiative, truck access to the peninsula must be improved by rebuilding and expanding the NJ Turnpike extension and interchange—a long-delayed project. The residential developments being built adjacent to the future port should be designed for a soft, transitional edge between residential and industrial uses. The Port of Los Angeles has done this successfully. Protect seaports and surrounding critical infrastructure from sea-level rise and storm surges. By virtue of their operating requirements, seaports are already fairly resilient. But with additional investments, ports could be designed to serve as buffers to help protect other vulnerable infrastructure nearby. Port Newark—Elizabeth Marine Terminal, for example, could help protect Newark International Airport and the I-95 corridor. Reduce noxious impacts to adjacent communities. Ships, on-dock equipment, and trucks are all sources of air, noise, and light pollution. The ports should provide shoreside electrical power to docked ships, allowing them to turn off their polluting engines. All the gantry cranes that have not yet been electrified should be. Only electric vehicles should be used for container movements within the ports. The Port Authority should take aggressive steps toward cleaner trucks—expanding the truck-replacement program, requiring low-emission vehicles as a default, and ultimately mandating a transition to electric trucks once they’ve become commercially viable. Light and noise abatement programs should be expanded, and measures should be taken to create transitional areas around the ports to buffer communities from those impacts. Giving freight access to existing and future passenger rail facilities, and developing new routes for both passengers and freight, would radically transform the way freight is shipped within the region, reducing truck traffic and cutting operating costs. Allow freight and passenger rail to share track infrastructure. Desegregating the rail network by encouraging freight service on passenger lines, and passenger service on freight lines, would increase the efficiency of the entire rail network, and would get thousands of trucks off the road. In order to overcome the operational and infrastructure hurdles, the three states should provide financial incentives to railroad operators (passenger and freight) to open up their physical infrastructure to one another’s operations. Developing infrastructure and operating standards to provide certainty to operators will be critical to the success of the system. Strengthen the existing northern freight rail gateway. 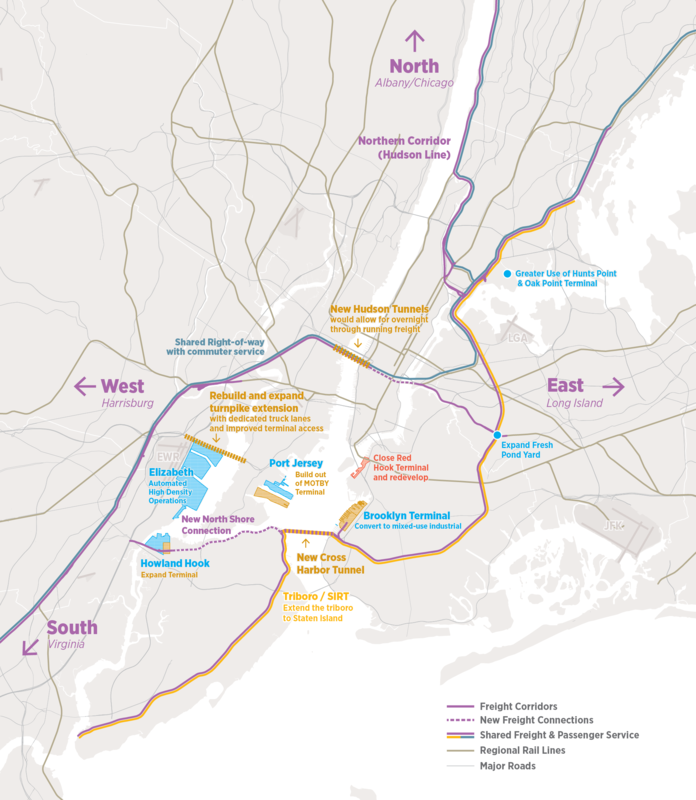 The northern freight rail gateway extends from the Brooklyn waterfront through Brooklyn, Queens, and the Bronx, then up the east side of the Hudson River. Thanks to the Oak Point Link connection and other improvements made over the years, this line now runs both passengers and freight service—and could accommodate more, as the Hunts Point market expands in the future. Oak Point Yard in the Bronx and Fresh Pond Yards in Queens are two facilities that should be improved and expanded in the near future to strengthen rail-freight access to points north. Build Gateway for freight rail too. The proposed rail tunnels under the Hudson River, a project known as Gateway, should be extended to Queens and designed to accommodate both passenger and freight services. Freight traffic could travel through Manhattan during off-peak periods, and connect the ports in New Jersey with the Lower Montauk line, a dedicated freight line that serves an industrial area and connects to Fresh Pond Yards and eventually the LIRR Main line. This would be the region’s first direct freight rail link between Long Island and New Jersey, and likely provide a service that would be more competitive than trucks—resulting in reduced traffic through Manhattan, Brooklyn, Queens, and Nassau County. Extend the Bay Ridge line to Staten Island. A new tunnel from Bay Ridge to Staten Island could provide freight access from New Jersey to Brooklyn via Staten Island. It could also provide valuable passenger service from Staten Island to Brooklyn by extending the Staten Island Rapid Transit System into the proposed Triboro line—providing direct access to Brooklyn, Queens, and the Bronx. This proposed tunnel would be significantly shorter than the Cross-Harbor Tunnel currently under study, and would open up countless transit options for Staten Island residents. This route would also connect the New York Container Terminal at Howland Hook directly to Long Island. These proposals would result in a modern and efficient seaport that would be a good neighbor to surrounding communities and return a profit to the public to invest in other regional infrastructure investments. They would also encourage the diversion of more goods to rail by sharing freight and passenger assets. The new investments would be partially paid for by reforms requiring renegotiated leases or assessments on lease-holders for capital investments. Another source of funds would come from the redevelopment of surplus facilities, such as Red Hook. The Port Authority should assess whether an outright sale or long-term land lease is the most viable option. Track/tunnel access fees paid by the private railroads could also help fund the capital improvements and would be a source of revenue to maintain the infrastructure over the long haul. Traditional funding sources from the federal government, like Railroad Rehabilitation and Financing (RRIF) loans should also be pursued.